American Housewife grew into one of TV's funniest comedies over its first season, and it's gotten even better in season two. They've gotten a pet pig, Katie has signed up for a project that she's obviously going to hate, George Hamilton's joined the cast and Anna-Kat's gone vegan. And that's just in the first few episodes! 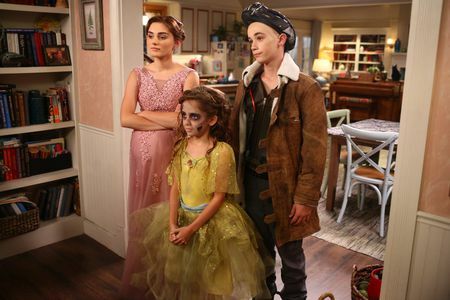 Needless to say, I'm very excited for this week's episode, where the show celebrates Halloween for the second time. The episode begins with Greg putting a nail on the door for someone to leave a "Boo" on the door. In Westport, a "Boo" is a tradition where someone hangs a decoration that says "You've Been Booed" on the door with a basket of candy on their porch. The Ottos have never been booed. But Greg thinks it's their year. Katie tries to rain on his parade by telling him they'll never be booed, but Greg is hopeful. Katie gets annoyed at a gardener who is blowing leaves, and Greg offers to deal with it. Greg is not good at confrontation, but he tries to deal with him anyway. Katie hears a scream, thinking it's Anna-Kat, but it's Oliver. Oliver's not happy by how easy he scares, because he wants to be able to go to a haunted house without being a screaming mess. Anna-Kat decides he needs immersion therapy, so he'll be getting scared by her a lot more. Greg fails at dealing with the gardener, so Katie does it herself. Later, Katie does a costume check to make sure the kids are ready for Halloween. Oliver says he doesn't need a costume, because the scare therapy isn't working. Katie isn't okay with this, and wants him to get over his fears. Taylor is going as a pregnant prom girl. Katie isn't cool with this. They are then called downstairs by Greg, who tells them that they've been booed, which delights the whole family. Even Katie! Katie brags to Doris and Angela about being booed. They wonder who booed her, and Doris says that she thinks Chloe Brown-Mueller performed the boo. Katie doesn't think so, but they tell her that Chloe did it because of Katie's new status as Spring Gala chair. Katie heads off to thank her, but Chloe says that Maria, her assistant, made a mistake when dropping off the boo. She wants her boo back, and Katie (rightfully) won't do it. Because Chloe's a monster. Taylor shows Katie her new costume, slutty ladybug. Katie refuses it again. Greg comes back in, and he has to comfort Katie, who is upset with the loss of their boo. He offers to go standup to Chloe, and Katie has literally zero faith in him. Greg bursts into Chloe's store, and he's already struggling. His costume makeup gets in his eyes due to the sweating, and he smashes everything in her store. Taylor comes down to talk to Katie about her costume, and she tells her how important the costume is to her. Katie agrees to let her go as a prom girl, and Taylor is ecstatic. Then, Greg comes in to tell her how horribly his attempt at standing up to Chloe has gone. She's still proud of him though, because she loves that he destroyed Chloe's shop. Oliver screams, and Katie and Greg rush upstairs to find Anna-Kat in his room, just after scaring the bejeezus out of him. Katie gets a plan though, and gets him a costume that will disguise his screams. Just when they're all about to leave, Katie notices a Boo on their door. It's from Greg, who decided to take matters into his own hands since everyone else in town is awful. This was another great episode for season two of American Housewife. It was an improvement on last year's Halloween episode, and I just really loved the story because their Boos are similar to a tradition in my neighborhood, so it's great to see it on a TV show, especially one this good. I really loved Greg's storyline this week, with the ending being really perfect. I also enjoyed the revival of Katie's feud with Chloe, and I though it was better than her previous appearance in "The Man Date." While quite a few shows this week disappointed with Halloween episodes (most by just not having them at all), American Housewife certainly isn't one of them.